Are You “Educating” Clients Out Of Buying? People say this when they hear I’m a sales trainer/coach, “I’m not a salesperson, I prefer to educate people.” Most people don’t want to be associated with the old school aggressive and frankly icky salesmen of our past. One of the worst insults someone could say is that I come off as salesy. Even the word makes my skin crawl. However, walking around with this mindset, “I’m not a salesperson” is not doing you any favors in your business. You’re actually saying to yourself, “I don’t want to sell anything” which means, “I don’t want to make any money,” which then screams, “I don’t want to succeed.” Now, is that really true? How’s this going to work if you want to stay in business? The second part of the statement, “I just want to educate people,” can be even more detrimental to your success. The reason being, not all of your clients want to be “educated.” Many people don’t need to know the ins and outs of everything you do, they just want to buy. When I started Sales Maven, I had the great pleasure of working with a business owner who considered it her mission to educate people. Not surprisingly her rate of repeat clients was low. She hired me to evaluate the overall client experience. One of the first things I noticed was she absolutely loved to explain in detail everything she was doing during a client visit. She talked the whole time. This woman is extremely knowledgeable, she’s also a very kind and friendly. She’s one of the most likable people you’ll meet. Her biggest challenge was, not all of her clients wanted to be educated. They wanted to enjoy the experience which meant, at times, she needed to be silent. Hence, this deep desire to educate was actually costing her repeat business. The solution I proposed was for her to ask upfront what the client’s preference was for the session. Did they want to know what she was doing and learn more about the products she used or would they prefer to just quietly enjoy the experience? 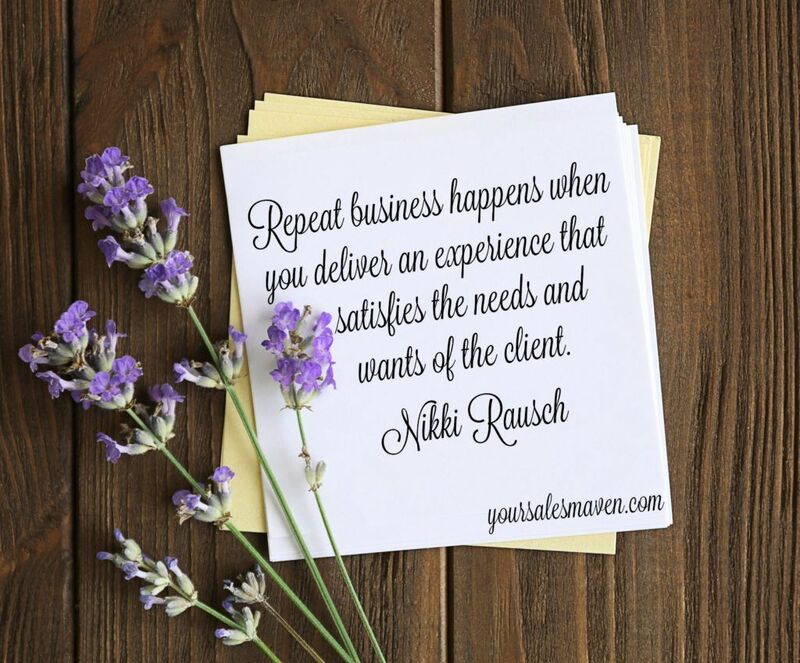 Based on their response, she was able to tailor the experience to meet the needs of the client. When we let our own agenda get in the way of the client experience, we’re sabotaging our success. Ask yourself, are you more interested in “educating” your clients versus meeting their needs? For those of you who can honestly admit to yourself that you’re more interested in educating, it might be time for you to start a movement, offer a class, become a teacher, or do something where people come in expecting what you’re offering – an educational experience. For the rest of you, it’s time to let go of this limiting belief, “I’m not a salesperson, I just want to educate people.” It likely hurting your business and turning people off. We get enough people preaching at us constantly, most of us are sick of it. To be successful at relationship selling, it’s not about you, it’s about the client. Their needs take priority. The companies encouraging their salespeople to show educational videos may actually be doing more harm than good. When a salesperson asks me to watch videos about their products, I say no. I’m not a fan of educational videos to sell products/services. I want real conversations with real people. This may come as surprise, especially since I often shoot videos as a way to deliver a weekly tip. The reason I offer videos is it’s what my clients are requesting. It’s not about me or for me, it’s about my clients. I’m willing to deliver the information in a way they want to receive it. How might you go about delivering information in a way your client wants to receive it? Are you willing to give up making it your mission to be an educator if it means you can actually help more clients get what they want/need?